I believe in the value of having 360 degree leaders evaluations. I had the unique opportunity to have the opportunity for an informal 360 degree evaluation that really wasn’t even intended to be an evaluation, but I used it as such. It started as an interview that one of our leadership team members wanted to conduct with me for a paper she needed to write for one of her Master’s classes. I absolutely love the journal and magazine articles where someone interviews a leader. After the interview, I was given a copy of the paper. While reading the paper I really began to reflect on what was being said and whether I really do practice what I said I do in my answers. 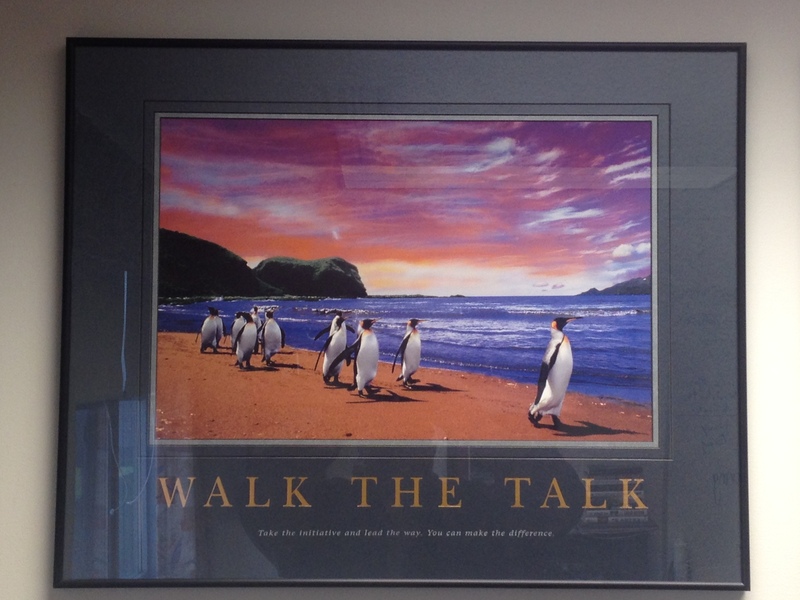 For those that have been in my office, you know I have a much talked about picture of penguins in my office with the title: “Walk The Talk.” The subheading is: “Take the initiative and lead the way. You can make a difference.” Walking the talk is one of my core values. It really speaks to the fact that our character is our legacy. If we say believe or act in a certain way, then our actions should prove that. With our team members permission I am sharing her paper here in this post. I hope it gives you a chance to think about how you would answer the questions and what would be written about you! The person that I chose to interview is Dr. Byron Ernest. He is the Principal at Emmerich Manual High School. I chose him because I feel that his leadership style embodies that of a successful leader. He is a leader because of the way he behaves, not because of his title. I have worked for people in the past who feel that you should follow their lead simply because of their title, with very little regard for how a true leader conducts his or her self. I asked Dr. Ernest what his leadership philosophy is and he said that “leadership’s about influence and empowering others”. “Everyone should lead from where they are. It’s just like in this building, I consider everyone a leader. They need to lead from whatever position they’re in.” He feels that it is important for everyone to hold themselves accountable. Some of the behaviors that he equates to leadership are being inspiring others, empowering them, and mentoring those who need it. “One thing that I think is important that a lot of leaders leave out…is helping employees in whatever their next position is going to be.” He feels that some leaders worry about retaining employees and keeping them in positions, rather than building leaders that are able to grow and succeed. He wants his employees to be able to look back and say “being here got me to where I want to go”. I asked him how he assesses his subordinate’s behavior. He said that he has an informal way of looking at that. He asks himself some of the following questions. “Is that person leading from where they are?” “How are they using that, what I call, earned empowerment?” “I want folks to take things on, and use their own initiative.” When it comes to the tools that he uses to measure these things, there is a performance evaluation that each teacher fills out each year. They have to write down some goals that they would like to achieve each school year. They list different projects and initiatives that they plan on taking on. At the end of the year, he sits down with each teach and goes over these goals and they assess whether or not they have been met. The next thing that I asked Dr. Ernest was how he deals with conflict. He said “conflicts are going to happen”. “One of the best things you can do is, is listen. And I think you always need to try to validate the other person’s problem, or where the conflicts are coming from.” I love that he mentioned this because empathy is one of traits mentioned in our text. “Besides fostering trust, empathy also equips leaders with a keen sense of social savvy that helps them sift through complex social dynamics and make good decisions.” (P.53) Dr. Ernest mentioned a specific situation that had transpired early that day, and he was able to listen to a parent to find out what their concerns were. He then went to the specific individuals that were involved in the situation and asked what had happened. This diffused the situation because the parent felt that their concerns were heard and that Dr. Ernest genuinely wanted to solve the issue. Then the issue was able to be solved. I asked Dr. Ernest how he demonstrates his values in his behaviors and he said that he does this “by walking the talk”. This has been mentioned in the text as well. The chapter on integrity talks about trust. It talks about how leaders should do what they say they are going to do. It mentions that you will have a more productive staff if they feel that they are able to trust you. “Basically it all comes down to trust. Integrity fosters trust, which leads to higher productivity.” “When employees trust their leaders, they don’t have to worry that their work won’t be rewarded, that promises won’t be met, that the organization will go bankrupt, or that executives will milk all the profits for personal benefit.” (P.25) I believe that Dr. Ernest’s employees trust him, and would agree that he does indeed walk the talk. He leads by example. He empowers his staff to lead as well. He does not micro-manage. He entrust you with responsibilities and provides you the tools to complete them. He tries to remove any obstacles they may get in your way. In my opinion, that is what a true leader does, and that is exactly why I chose to interview Dr. Ernest. Thousand Oaks, CA: SAGE Publications Inc.